Hi there! I love pedis but have never had a facial....might like them too!! Would have to be a lovely massage for me. Thanks! someday you should have a giveaway that is specifically for NON-US residents because it's kind of not fair. Especially because as I read, I had already decided that if I won, I was going to give the gift card to a special friend of yours out of the goodness of my heart (and fine, for her birthday!) But now i'll have to spend actual money on her birthday. Thanks! And PS, my fave spa treatment is the FREE kind. I love a massage but most often get pedis because its a nice treatment thats like a goody bag at a party- you get the pretty toes to take away. But when we were in Borneo and massages were like $3 for an hour, we got lots and lots and they were AWESEOME! My favorite would have to be a massage. I've never had a professional one (yet!) but I know that would make my month. My favorite spa treatment for enjoyment purposes is a massage - for beauty purposes it's a facial/mini-peel. I could really use both right about now! I love a massage and I've been wanting a pedicure! I love a massage most, but am more likley to get a pedicure - they are great value and last for ages, while a manicure is destroyed preparing one meal. I follow on Blogger, happily! I'd be smitten with a facial. I'm lucky if I even wash my face each night! Thanks for the awesome giveaway. I follow you on blogger too. I'm with you -- facial with PAINFUL EXTRACTIONS! BLISS! If it doesn't hurt a little, I refuse to believe it does any good. I am a masochist and I love it. yay - Great giveaway! I love getting a facial done. I haven't ever had any other thing than mani/pedi... I'm with you on needing to take more/better care of myself. But it seems we have our hands full with all the 'taking care of' that we can muster, huh? OMG...what I wouldn't do for a massage! Carrying around a 2 year old sized body with 4 month old muscle tone can really wear a body down!!! and one more for liking you on facebook! I used to be a pedi girl, too, but now I feel too guilty to spend the money. Or too afraid to tell my husband I spent the money ... ha! Thanks for a great givewaway! I also liked the spa week on FB. I love spa pedicures with extra foot massage time. :) And my toenails could use the TLC right now! I am a facial girl myself. I love massages. :) Pedis are fun too but I only get one every few years. Love massage, facial, mani & pedi! Love love love!!! I'm a LTM fan on Facebook! I love getting pedis and facials! My skin seems to glow afterwards! I 'like' spa week on facebook! 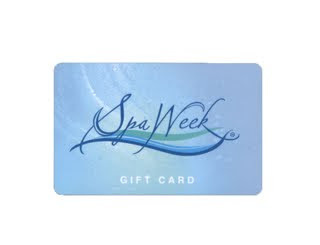 • Liked Spa Week on Facebook. Pedicures are my favorite- my feet always get so callused! I am a mani/pedi girl! For a big splurge a facial is great as well. I "Like" LoveThatMax on Facebook!